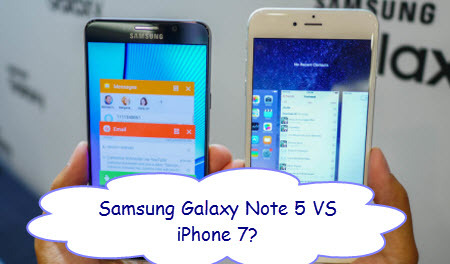 Samsung Galaxy Note 5 vs iPhone 7 – Which one you choose? Galaxy Note 5 vs iPhone 7 – Which’s one’s gonna end 2015 with a bang? Since the rumors of Samsung Galaxy Note 5 and Apple iPhone 7 has started , and it would be the best time to compare the smartphones on such rumors . The end of Apple and Samsung war will never approach. Ever since news reported that iPhone 7(or iPhone 6s) would be launched in 2016, people have been talking left and right about new features the giant will bring us. The Samsung Galaxy Note 5 has been launched on Aug 14, 2015. This is the best news for Samsung fans. Here, I’ve gathered all the rumors associated with Samsung Galaxy Note 5 and iPhone 7, and bring you detailed information about comparison between Samsung Galaxy Note 5 and iPhone 7 in design, display, price, release date, camera etc. for you to check out. Apple hasn’t announced the release date and price of iPhone 7/iPhone 6s, but we can take an educated guess that iPhone 7 will be unveiled in August with a price starting at £619. Not left behind in the comparison between Samsung Galaxy Note 5 and iPhone 7, Samsung will launch Note 5 during the height of summer. There won’t be much price differences between Samsung Galaxy Note 5 and iPhone 7, Note 5 is around £629, but the price is expected to come tumbling down, otherwise, in the Samsung Galaxy Note 5 vs iPhone 7 battle, Samsung may lose. Definalty Note 5 would take a lead in specification considering the fact that Apple iPhone 6 just has 1GB of RAM. Note 5 would be bigger compared to Apple iPhone 7 . Since it is predicted that Apple iPhone 7 would have a max of 5.3 inch screen , Note 4 alone has a screen of 5.7 inch and we guess that Note 5 might go near 5.9 inches. Both these smartphone would be optimized for the best possible performance and user experience .Since iPhone 7 will be having iOS as a OS platform and Note 5 would be having Android , it would be tough to say which one will perform better . So this would be only possible to say one the smartphone are released. Comparison between Samsung Galaxy Note 5 and iPhone 7 camera is essential. It is reported that Apple would implement a new camera technology ensuring better low light performance, faster exposure into the iPhone 7. It is also believed that Apple will adopt a larger camera sensor up to 12MP, increasing 4MP compared to 8MP sensor on the iPhone 6. Samsung Galaxy Note 5 vs iPhone 7 in camera, iPhone 7 takes a good chance, as Samsung only boasts a 16MP camera sensor, and Google’s camera API(old stuff). Software also plays a big part in the Samsung Galaxy Note 5 vs iPhone 7 war. iPhone 7 will run new iOS 9 unveiled at 2015 WWDC that is expected to embrace new features, including improved stability. A new look Siri yet with enhanced security is hopefully seen on the new iPhone. There aren’t many rumors related to the Galaxy Note 5 software, but one thing we’ve heard of is that the Note 5 will focus on new camera technology, as well as Android 5.1 update, which changes the software comparison into iOS 9 vs Android 6.0 war. Tip 1: If you get some MKV, FLV, M4V, WMV, MOV, MP4, Tivo, XAVC, M2TS, H.265 etc. videos, and have trouble to convert them to iPhone 7, Samsung Galaxy Note 5, you’re in the right place. Similarly, we need to solve the problem is still compatible format. You can get Pavtube Video Converter Ultimate. A powerful all-in-one tool to convert HD/4K videos, Blu-ray movies and DVDs to iPhone 7, Samsung Galaxy Note 5, MP4, AVI, WMV, MOV, MPEG, Surface 3, iPhone 6/6 Plus, Samsung Galaxy S6/Edge, Sony Xperia, Google Nexus, Windows Phone, PS3/4, Xbox etc, and deliver high quality video/audio quality at fast conversion speed for playing nicely. Free try this software and follow the steps to try it out now! Tip 2: There are a lot of users want to know the way to remove DRM protection from iTunes movies or TV shows and turn them into iPhone 7, Samsung Galaxy Note 5 , here I will share the best iTunes DRM removal software with you – Pavtube ChewTune. It’s an easy-to-use and intuitive DRM removal tool that can legally produce a DRM-free copy of the original. Specially designed to convert iTunes movies and music to any format you like. with the fastest speed and best video/audio parameter settings. Free try this software and follow the steps to try it out now! Both the iPhone 7 and Galaxy Note 5 will unquestionably attract a huge amount of consumers when they are released later this year. At the time of writing, it looks as if the Galaxy Note 5 will include some truly revolutionary aspects, such as the first ever 4K resolution screen in a mass-market mobile device. However, Apple is working hard to ensure that the iPhone 7 is a significant departure from the previous devices in the series. And Force Touch can be considered something of a killer app, after it created a strong impression is the reason Apple watch.